Blanket chests were very popular during the 17th thru 19th centuries. Over the years, drawers were added to the basic form, increasing the height, and gradually a different piece of furniture evolved called the mule chest. The drawers in a mule chest were used to store slippers called "mules" by the colonists. The first colonists had no closets in which to store their clothing, blankets, and household linens. Attics were not readily accessible, and cellars were apt to be damp. Thus, the chest came into use. 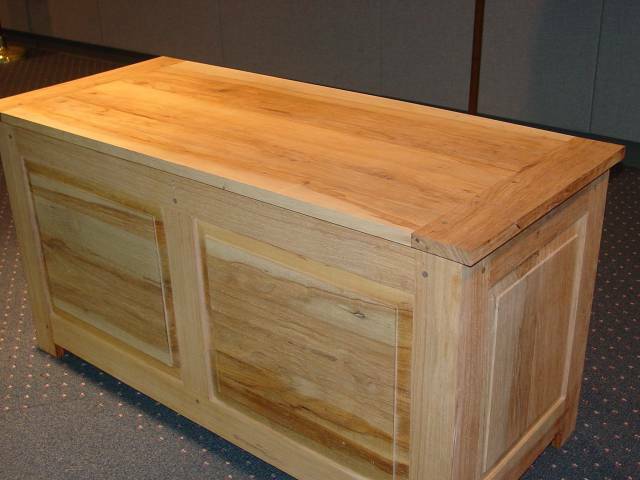 In its simplest form, the chest was a large wooden box with a hinged lid. Although it functioned primarily as a receptacle for clothes and valuables, it also served as an additional seating place, for chairs were a luxury in most homes. Frequently chests were used for the storage of linens and things, especially those a bride brought to her husband. This is known as the dowry. From this evolved the name "hope" chest, now commonly used. Early ships' records show the chests to have been the sole items of furniture accompanying many settlers. It is not surprising, therefore, that the chests built by seventeenth-century joiners in this country were copied from English pieces designed in the prevailing Jacobean style popular in London at that time. As early as 1660, craftsmen in Massachusetts and Connecticut were fashioning paneled and carved oak chests, constructed of wide stiles and rails. These had floating panels with elaborately carved intaglio decorations. Instead of a paneled top in the English fashion, the Colonial chest had a plain pine board top. This unadorned top surface was ideal for seating and did not need cushions thereby making it more functional. In their crude fashion, these chests were the counterpart of the elaborate coffers, and caskets owned throughout Europe by wealthy families. Many households would not do without one of these blanket chests as few homes had a source of heat within the bedroom. On chilly nights it was convenient to merely go to the end of the bed and extract more bed covers to keep warm on those chilly nights. During warm seasons the blanket chest stored bed covers in a convenient location. In colonial America blanket chests were constructed of various species of lumber ranging from inexpensive pines used for "country" type furniture to more expensive hardwoods such as walnut, cherry, and imported mahogany. The latter were used for more formal pieces of furniture that only the very wealthy could afford. 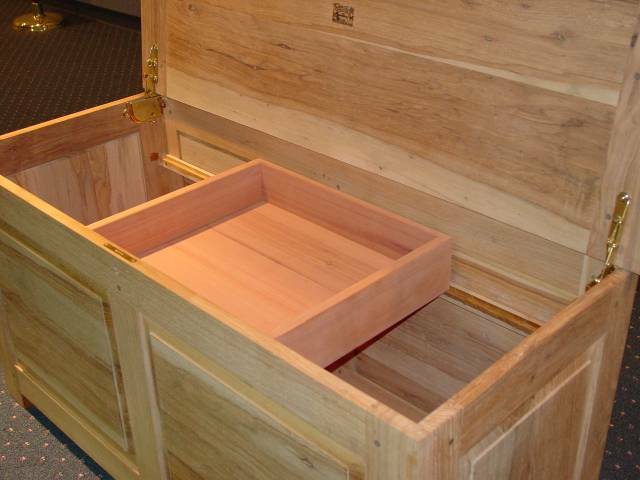 Some of these chests were lined or constructed of pleasant smelling aromatic red cedar that repels insects. Pennsylvania Dutch chests were often hand painted with traditional decorative motifs. This blanket chest is constructed of solid pecan that was harvested in Houston, Texas, by J. G. Hutchison, and with solid aromatic cedar. 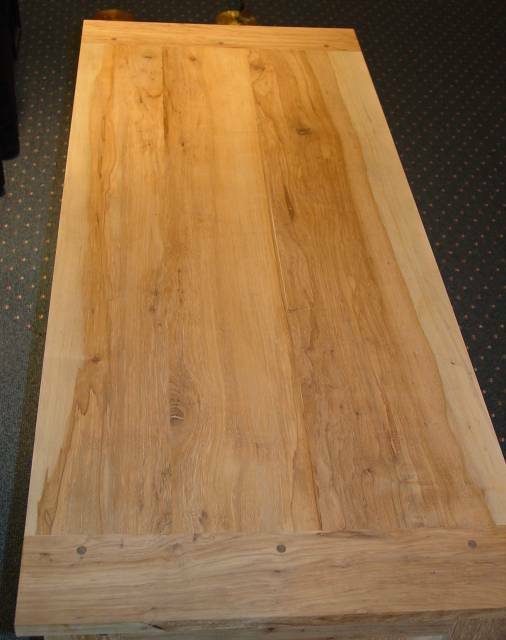 Pecan is a member of the hickory family and is one of North America’s hardest of hardwoods. Pecan trees thrive in the hot, humid climate found in the southern part of the United States. Pecans often grow to massive size with trunks as large as five feet in diameter. The tasty pecan nuts are an important cash crop. Pecan is a close relative of black walnut, but unlike the elegant look of walnut lumber, pecan lumber is characterized by streaks of dark sap pockets, small knots, wormholes, and variegated coloring of sapwood and heartwood. Pecan is a fine furniture grade hardwood that finds its way into less formal looking pieces. This chest is a perfect example of a piece designed for use in a log cabin in the woods to be placed within the master bedroom. This chest has a solid ¾" aromatic cedar bottom, and a sliding 4" deep tray made of cedar that is supported by internal rails. Traditional frame and panel construction was used to build the carcass of the chest using 1-1/2" deep tenons that were pegged with walnut dowels to securely mate the top and bottom rails to the vertical stiles, and to encase the ¾" thick floating panels. Biscuit joinery was used to mate the side panels to the front and back panels. Dimensions of the carcass are 24" high x 19" wide x 45" long. The finish consists of six coats of hand-rubbed low luster tung oil finish, with a final coat of carnauba wax. The hardware consists of a high quality brass-plated, full-mortise chest lock, and friction scissor chest hinges that conveniently hold the top open. This chest is certain to become a future antique, due to its traditional construction techniques, use of high quality materials, and timeless beauty.